Monarch butterflies are often called international travelers because they can fly from Mexico to North America. They are bright orange with white dots and black line markings. They live in Mexico in the winter and fly (migrate) to North America in the summer. They can even fly 3000 miles. Some monarchs fly from western Mexico to California but most stay east of the Rockie Mountains. They can fly as many as 50 to 100 miles a day. Monarchs lay their eggs on milkweed plants. When hatched they begin life as caterpillars and only eat leaves from the milkweed plants. Monarch caterpillars have many yellow, black, and white stripes. Look for them on milkweed plants. Next look for the chrysalis (tiny pod home) they form on nearby surfaces. Finally, after 10 to 14 days a beautiful monarch butterfly emerges. Monarch Butterflies are disappearing and here is why: Earth is warming so the area where monarchs live and migrate causes them problems. Storms hurt monarchs. 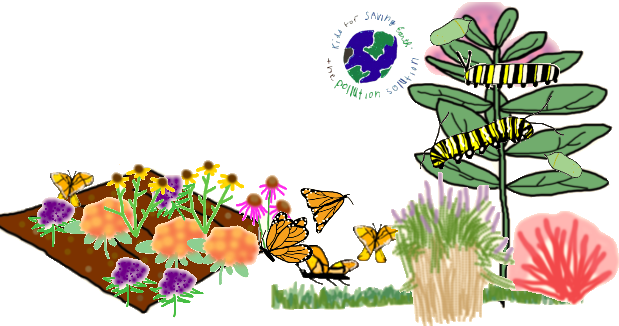 Pesticides are killing butterflies and milkweed plants that they need to survive. Loss of habitat (homes) factories, parking lots, homes, highways and more are replacing butterfly homes. The monarch population has dropped about 68%. Their homes are disappearing. 1. 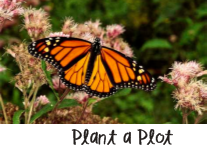 Let’s plant a plot for monarchs. It doesn’t have to be large. It can even be a group of pots on a balcony. 3. Google where you can find the right plants or seeds for your area. 4. Plant and water as needed. 5. Be patient. It may take a couple of years to start blooming.